eCite - How Good Is My English? 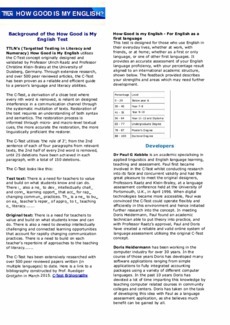 TLN's (Targetted Testing in Literacy and Numeracy) How Good is My English utilises the C-Test concept originally designed and validated by Professor Ulrich Raatz and Professor Christine Klein-Braley at the University of Duisberg, Germany. Through extensive research, and over 500 peer reviewed articles, the C-Test has been proven as a reliable and efficient guide to a person's language and literacy abilities.